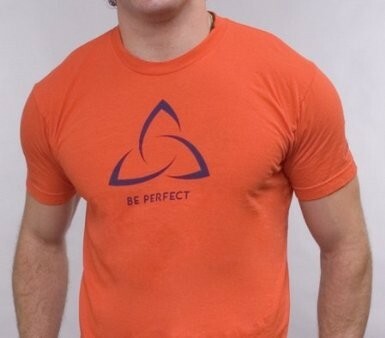 Orange Shirt with Navy Blue Symbol Symbol: Triquetra Symbol History: The term 'triquetra' is taken from the Latin root 'triquetrus', meaning "three-cornered." The symbol is comprised of the center connection points of three interwoven circles, distinct yet equal and inseparable, symbolizing the triune God -the Father, Son, and Holy Spirit - in the trinity. Scripture Passage: The phrase "Be Perfect" is taken from Matthew 5:48: "Be you therefore perfect, as also your heavenly Father is perfect."